The V.L. Boys are Tripogees and Ludrain. They have been on scene since the year 2000 with their first hit single ‘Otwakindja’. Vote for your favorite artists now in order for them to win the 2008 NMA award. and imitating rappers such as Tupac Shakur, LL Cool J as well as Shikololo, who was then the only successful local Hip Hop artist at the time. In 2007 he met Exit. The 7th of April 1989 saw the birth of Shikalepo David who would grew up to become “Exit”, one of the country’s freshest, most talented artists. Born in Oshakati, Exit grew up in Oshakati, attending school in and around that vicinity from lower primary until he finished his high school career with exceptional grades. In 2007 he moved to Windhoek to pursue his BAMS (The media laws) degree at the University of Namibia (UNAM). It was then that he met Mushe, an experienced, up and coming local producer/artist with a studio in Katutura. 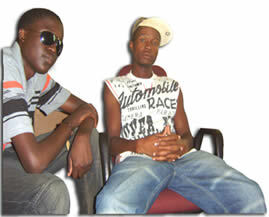 Exit joined Mushe’s “2-tight” Hip-Hop crew and they set off to work on some potential classics –Exit and Mushe was born. They changed their genre from pure Hip Hop to a fusion of Hip Hop and Kwaito, creating a unique sound that warmed fans the country-over. Their first performance was at the annual Ongwediva Trade fair in the northern town of Ongwediva. They landed under the management of Blend Productions and within weeks they were in demand, performing at various events, sharing the stage with established artists such as PDK, Gazza, The Dogg, Killa B, Max, D-naff, Gal level, Sonny Boy, Phura just to mention a few. They also wowed the crowds at Max’s and PDK’s CD launches, both at Bernie’s Entertainment Park in Ongwediva. Their combination video for the singles “(Olye ekulonga) Okwiimaba”; and “Lets get down to business” are receiving major air-play on Namibia’s leading TV stations. Another one of their singles, “Oka-styla” is burning up the hearts of many fans country-wide. With only a few months in the industry, this bundle of young talent is set to warm the Namibian music industry for many, many years to come “…now let’s get down to business”.